For over 65 years, the Jungle Queen Dinner Cruise on Fort Lauderdale Beach has been an epic legacy that truly defines the meaning of entertainment, sightseeing, good eats, and a truly unique overall experience. This experience is something that everyone should do at least once in their lives; it is truly a redefining encounter that is guaranteed to leave you with a full stomach, and a smile on your face. This article will give you a detailed idea experience of what a typical ride on the Jungle Queen will entail. Before any epic adventure begins, starting with basics is a must. Getting tickets is the first step and you can do this a number of ways, either by ordering them online, calling over the phone or by arriving at the Jungle Queen ticket booth to purchase them directly. Just be sure to ask for a good seat when you are purchasing, otherwise you could be placed anywhere on the boat. Parking is the next objective and this can be slightly challenging. There are two main options for parking, that is either within the Jungle Queen and Bahia Mar Hotel complex which will run you around five dollars, or you may park across the street on the A1A parking or known as Fort Lauderdale’s South Beach Public Parking lot. There was some mention toward the end of the trip about a discount if you parked in a certain area, but the announcement wasn’t very detailed. Be sure to ask pre-hand where there are discounts available for parking, as it is an expense before you get on the boat. After purchasing tickets and parking, the next step is to collect the tickets at the ticket office, once again, it is a good idea to remind them that you want a good seat, preferably a window seat, because that is where all the action is. Once you have your tickets its time to board the Jungle Queen, there isn’t really any formal line; you just have to go in the general direction everyone else is going. A really nice feature is that they take a photo of you and your party just before you enter the boat which you can later purchase, cementing in the commemorative and exciting experience. Once you board the boat, you have to figure out the seating, it will use nautical terms like starboard which means right and port which means left, adding to the authenticity of the experience. Your ticket might say seat 2, row 12, and Port side. It’s very important to note that the seating is not bolted down to the ship, it is movable and ever shifting, but the good news is you can just ask any of the friendly staff for help, and they will be very happy to show you right to your seat. In the event that you don’t like your seat, you can do a few things; you may ask for a seat change to any available seats that are not being used, or you may wait till the ship takes off and if there are any no shows, or available seats that were not taken, you may now occupy those seats. Always aim for a window seat if possible or one close to the window; you will get the most out of the experience that way. A very nice feature of the trip is that they have an announcer, who acts as the tour guide and the effective comic relief as you see how the richest one tenth of 1 percent of Americans live, as he would say. Now to the fun part, after all the hustle and bustle to get on the ship and secure your seat and get acclimated, you can finally sit back and relax. The ship will take its course on the New River, which has existed for hundreds of years, and Fort Lauderdale is now considered the Venice of America. Two hundred breath taking and visually stunning miles of waterway envelops and overwhelms the senses. If you haven’t figured it out yet, a camera here is an absolute must, you may never see some of these homes and luxurious luxury liners again. As the ship begins its journey, the announcer explains the overview of the evening, first with the length of the ride to the island, then the procedure on where to go for being served the buffet, and where to go for the show and finally at what time you need to be back at the ship, just a quick mental snippet to give you a general overview of what’s going to happen and to give you a tinge of excitement and joy. The ride to the island is roughly an hour, and on the way, you see exotic mansions of every size, color and proportion; you may see boats of all sizes, from speed boats, to yachts, to commercial boats. As you continue traveling to the island you hear of all the famous people who have ever lived in some of these opulent and absolutely stunning houses, names like Demi Moore, Wayne Huizenga, Al Pachino and many others, are thrown around. And as you begin to hear how much some of these water front properties cost, ranging from 5 million to hundreds of millions, you begin to understand just where you are and why everyone is so nice and always taking the time to wave at you; its pretty easy to when you are this rich. Another fun and exciting interactive experience while on the Jungle Queen, is when you are passing under the various mazes of bridges and waterways, at the passing under of every bridge, you have to make sure to yell at the top of your lungs, “Hello Mr. Johnson” (the owner of the bridges) otherwise you wont be able to come back according to the announcer. There are several bridges to go under, but the Jungle Queen receives excellent service response from the bridges and most of the time the bridge is already open waiting for the Jungle Queen to pass underneath. After an hour of breath taking view, hearty yelling, and good wholesome clean fun, the ship finally arrives on the private island. Disembarking to the island takes a few minutes, and once you arer on the island you are free to do what you like until its time to come back. Obviously by this time everyone is starving so the first thing most participants do is head straight for the buffet to chow, down. 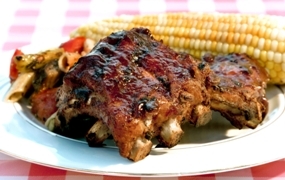 You cant help but be excited at an endless line of staff coming towards you with gigantic plates of glazed Barbeque ribs, spicy shrimp, grilled chicken, French fries, Cole slaw, beans, rolls, the list goes on and on. Beverages you have to pay for and they have a wide variety of alcoholic drinks and regular soft drinks, prices vary and the alcoholic drinks do cost more than regular drinks. However most participants didn’t mind paying the little extra to complete a time of great celebration and fun, and in one’s observation it is worth every penny. Towards the end of the meal, comes the serving of dessert, endless waves of chocolate crème cake, time after time you could observe customers taking four to five slices of the delicious mix. The service is phenomenally good and they are very efficient at circulating the food quickly. Please remember to leave a tip if possible as they do try very hard to please everyone in a timely fashion. After the gut busting barbeque banquet, you have the option to look around at the various types of animals and wildlife that is located on the island, from parrots, birds and monkeys, to crocodiles and alligators, you definitely are going to see some creatures you haven’t seen before. Just be sure to not spend too much time there as the entertainment will begin shortly, and getting a good seat is always a smart idea. Once you have secured your seat, which is conveniently set right next to the eating area, you can sit back relax and literally enjoy the show. The master of ceremonies will come out to greet the audience with a witty joke and a warm hello, and will begin introducing the performers, every event has different performers, on this particular evening, we had a gentleman that could mimic any known TV character, and impersonate them with a high level of accuracy. 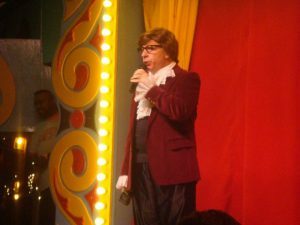 This entertainer mimicked stars like Arnorld Schwarzenegger in terminator, Austin Powers in Gold Member, and many other sketches, he also changes his outfits very quickly to keep up the laughter with new impersonations. The second performer was a magician, who did a variety of very impressive tricks, like poking a hole through a volunteers neck, with no trace of the hole, tearing a newspaper to bits and then unfolding it perfectly seconds later, showing a dove out of his hands where there was clearly nothing before and many more. Overall the food was excellent while the entertainment was a little cheesy at times; like most things, it had its ups and its downs, still a great overall experience. 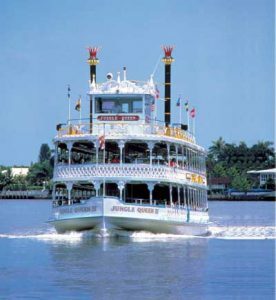 Overall this experience can be summed up in 3 words, “an absolute must”, The Jungle Queen typifies a riverboat cruise that has all the entertainment, sightseeing adventure, food and romance anyone could ever want. With a friendly staff and great service you cant help but say this is just an awesome experience. 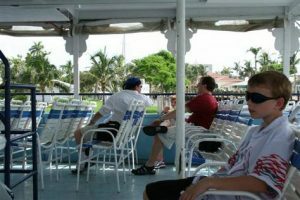 There is a good reason the Jungle Queen Fort Lauderdale Dinner Cruise has been in Business for 65 years. They are extremely good at what they do and they are happiest when the customer is pleased and satisfied with the experience. 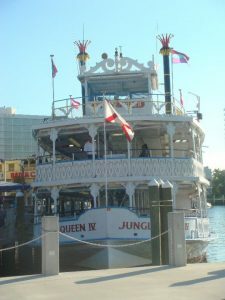 If you haven’t taken a ride on the Jungle Queen, you can save it for a special occasion or anytime you visit Fort Lauderdale, for it will be a night that will impress upon you for years to come.